Our work is done here! 20 years. Lots of work. We’re sad to let The Australian INfront Design Community go, but it’s for the best, to leave on a legacy of love and respect. We’ll be shutting down the site on the 8th of March 2019. Please be sure to back up everything you may need before the site is taken offline. There’s no doubt that myself, Damien and Zann still have a ton of love for the Australian INfront (we most likely always will!). Traditionally we’ve always launched site redesigns, in fact we’re more than half way through the new site design now, but life has gotten in the way for all three of us, and we’ve had to re-assess the launch of the new Australian INfront. Since INfront’s conception in 1999 I’ve had more time than most to put energy into the site, but I can’t say that I’ve done much at all over the past 10 years. 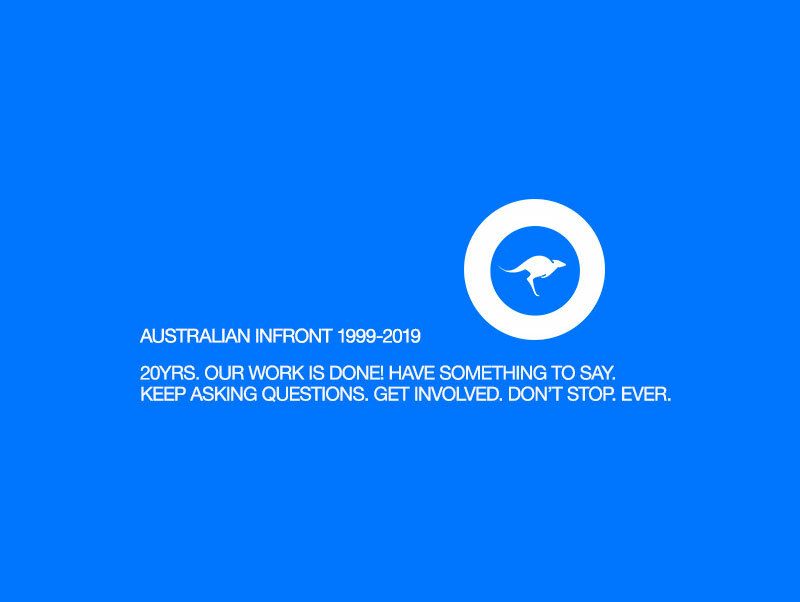 Rebelling against my professor of Design by presenting the Australian INfront manifesto at Sydney Design 99 Conference (instead of spending the time on the stage praising my old design school) was a bold move. Big moves like this have been made time and time again by Damien and Zann with INfront Apple Talks at the Apple flagship store Sydney, Field Trip Conferences at ACMI Federal Square Melbourne and The Seymour Sydney to name just a few. One quick glance over both Damien and Zann’s personal Facebook profiles suggests that between work and family the guys are extremely time poor. Recently we got a 3-way chat together to discuss INfront’s future; Are we going to relaunch this new re-design? Because INfront needs HEAPS more love to get it anywhere near where we had it once upon a time, and it needs even more love and energy for us to take it to where Damien and Zann can. INfront is a passion project. Something which the three of us forget at times. We still love the creative community and some part of us will always want to be part of it, just so we can help out, but INfront has had so many amazing moments that we’ve come to realise that as time goes on we can’t live forever in those past moments, and now we have our families to put our love and energy into too. 20 years… it’s been a GREAT run and we are proud of staying true the entire way through. To the founding members (you know who you are!) massive respect and thanks for the groundwork. To everyone else; we have nothing but GRATITUDE for all those who have ever stepped up and joined us on this epic mission to get Australian Design the respect it deserves, to place our local talent on the International Map. We started with the Australian INfront Manifesto. We’ll wrap it up with it too. INfront is a collaborative project space and launch pad to Australia’s best online designers, artists, design companies and other related web sites. INfront is also a growing community of like minded people who inspire and motivate each other. Lean on each other at times. Bend the rules. Help when there’s a need for a freelancer, a brainstorm, an opinion or some constructive criticism. INfront intends to expose talented Australian designers and artists and change the international perspective of Australian Design and Art to a more accurate level, one that reflects the sophistication, individuality, and passion of designers and artists in Australia. Australia, design & art are fundamental to our being and as a group we intend to explore what this means to ourselves and the international community. Our work is Australian and of international standard. Please note; we will be shutting down the site on the 8th of March so be sure to back up everything you may need before the site is taken offline. Much love and respect; Justin, Damien and Zann.